In the midst of mom busyness, good quality washing machines bring a little bit of heaven to our days. But even if technology has made our lives easier, we, moms still have our hesitations in putting all our clothes in the washing machine. We still prefer to handwash delicates like silk, cashmere, and wool. That dreaded himulmol, stubborn stains, and misshaping of clothes are real laundry concerns. Moms, Electrolux has heard us load and clear. It has created the UltimateCare™ range of washing machines, designed to help women care for their clothes. 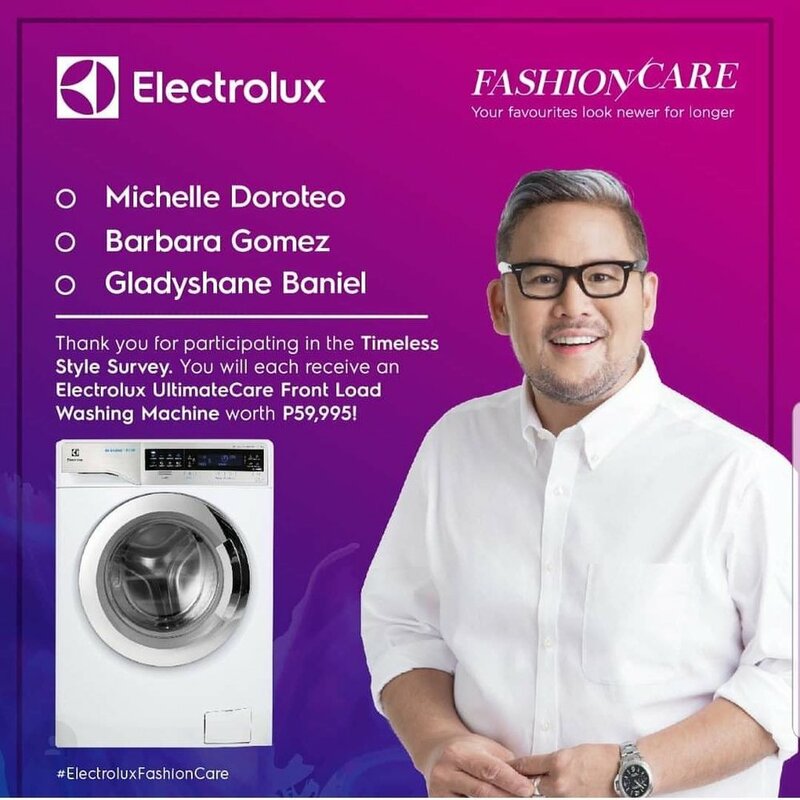 And this September 2018, at the FashionCare Season 2 Premier Party, Electrolux Philippines FashionCare Ambassador Rajo Laurel and FashionCare Council Members Amina Aranaz-Alunan and Janice Villanueva put the UltimateCare™ washer dryer to the test as they challenged Electrolux to wash their designer dress, silk scarf and wool jacket, respectively. Let’s see how the Electrolux UltimateCare washer-dryers rose to the challenge. Amina washed her colorful silk scarf with no hesitation. “I could keep using this over and over again thanks to Electrolux’s UltimateCare™ washer dryer which has features that care for delicate pieces and keeps them looking new and vibrant,” says Amina. Janice had apprehensions about putting her wool jacket in the washer-dryer. ““I used to hand wash wool sweaters like this one because I was afraid it would get stretched out of shape. So I’m excited that the Electrolux’s UltimateCare™ washer dryer can safely wash woollen items and make sure they look their best,” Janice said. And true enough, her wool jacket was undamaged and soft to the touch after wash-dry cycle. Rajo’s designer dress came out of the wash in perfect condition. “I know that Electrolux understands how important our clothes are to us, and I’m grateful for it. I feel safe knowing that my clothes are in good hands with Electrolux’s UltimateCare™ washing machines,” shared Rajo. Electrolux’s UltimateCare™ washing machines passed the challenge with flying colors! And soon, lucky moms, are going to experience this magic firsthand with their very own Electrolux washing machine. Here are the lucky winners. Electrolux’s UltimateCare™ washing machines come with UltraMix™ technology that removes stains and provides better fabric care, helping clothes retain color, shape, and softness for all your precious garments. UltraMix™ gives powerful yet gentle deep cleaning. It also extends the life of clothes with Vapour Action that softens fabrics while reducing allergens by up to 99.9%. And that’s not all, you also save electricity with Electrolux’s UltimateCare™ washing machines’ Eco Inverter Technology. In line with its FashionCare campaign, Electrolux is offering several great deals on its washing machines, with offers up to 25% off on selected front load washing machines and washer- dryers. Women can also avail of selected Electrolux Front Load Washing Machines and get 25% off on an Electrolux Front Load Dryer. Also included is a free stacking kit and installation valued at PhP 3,049 with this fantastic bundle deal. Promo period runs from July 1 to September 30, 2018.